Second Lieutenant Chattrapati Singh, hailed from Badrola village in Ballabgarh tehsil of Faridabad district in Haryana. Son of an Army veteran Lt Col Girdhari Singh and Smt. Godha Devi, 2nd Lt Chattrapati Singh was second among five siblings. He had the inclination towards the Armed Forces since his childhood and continued to pursue his dream while growing up. 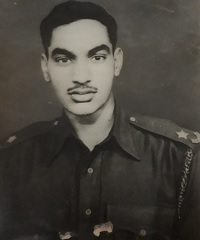 After completing his 12th from Dehradun, he got selected to join the prestigious NDA and thereafter went to IMA at Dehradun in the year 1960. 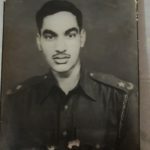 Besides being a tough and dedicated soldier, he was a keen sportsman and had been participating in various sports events since his school days. 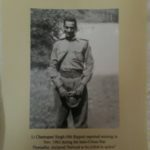 In 1960, 2nd Lt Chattrapati Singh was commissioned into 4 Rajput of the Rajput Regiment, a Regiment known for its fearless soldiers and various battle honours. 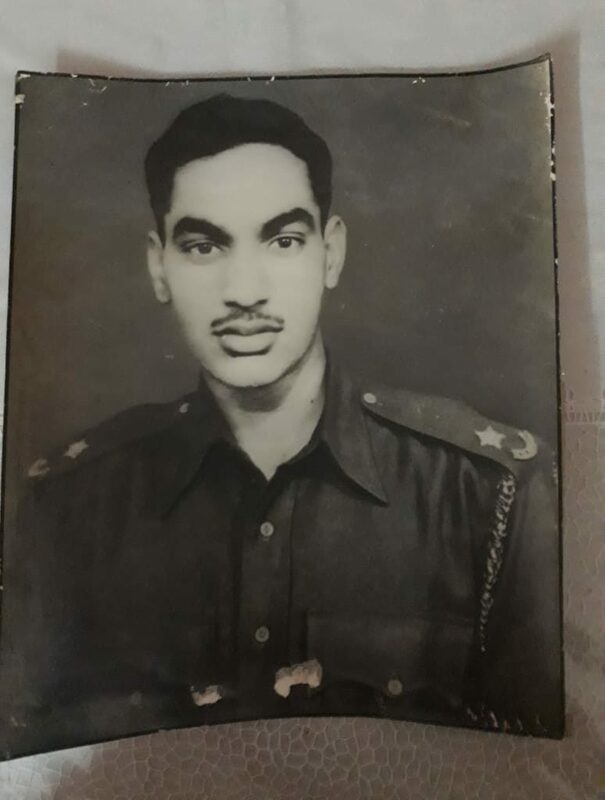 Coincidentally his father a “Vir Chakra” awardee had commanded the same battalion as Lieutenant Colonel and had participated in Kashmir operations. During the 1962 Indo-China war, 2nd Lt Chattrapati Singh’s unit, 4 Rajput was deployed in the North-East Frontier Agency (NEFA) region. After the ambush of around 200 soldiers of 1, 2 and 4 Sikh LI under 65 Infantry Brigade, a decision was taken to withdraw from Sela. With 62 Infantry Brigade falling back from Sela, Lt Col Awasthy the Commanding officer of 4 Rajput, decided to defend Bridge 1 to allow the brigade and remnants from 4th Division to retreat. However, 62 Inf Brigade never returned and the remaining soldiers filtered through some other routes. Finally, Lt Col Avasthy pulled back to Lubrang destroying any stores that could not be carried back. From there he moved to Phudung joined by various stragglers, many of them wounded and had to be carried. When this force reached Priyadung, they saw that the track bifurcated with one side climbed towards an old monastery Lagyala Gompa and the other followed a stream towards Morshing. Lt Col Avasthy decided to take the route to Lagyala Gompa. Lagyala Gompa, one of the holiest Buddhist shrines was located on a high feature overlooking the Morshing Valley as well as the route Lt Col Avasthy was taking. There was a plateau just before it made its steep climb to the monastery making it an ideal place for an ambush. The movement of 4 Rajput’s troops was being tracked by the enemy forces and a 500 strong Chinese unit had already moved in behind with one group was waiting in ambush at Lagyala Gompa. As 2nd Lt Chattrapati Singh and his troops approached the Gompa they came under heavy fire from the Chinese. They could have probably chosen to fall back and look for another way around but decided to fight the Chinese. Although lacking heavy firepower Lt Col Avasthy launched a 2 pronged counter attack. The battle was fierce and finally, it came down to hand to hand combat. However after a few hours of fierce fighting, the Chinese prevailed. 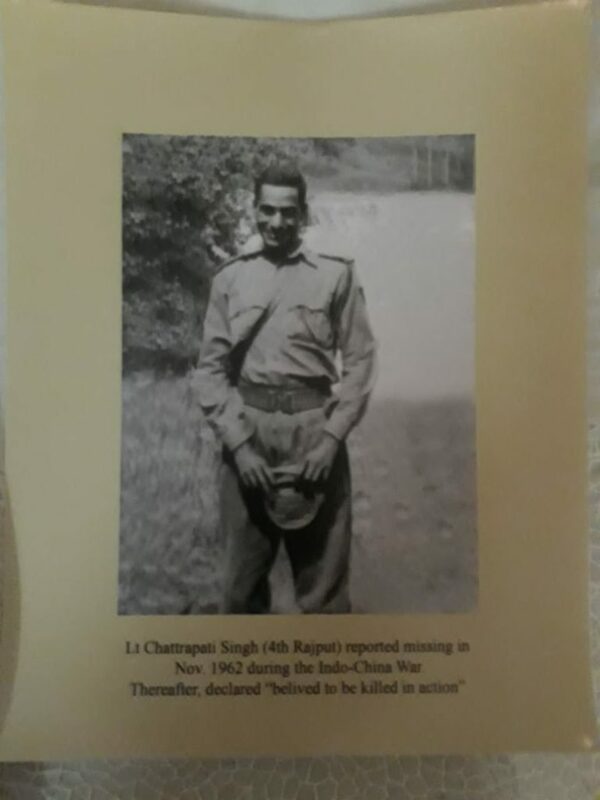 2nd Lt Chattrapati Singh and all his gallant soldiers including the CO were martyred and the battlefield was littered with the bodies of 126 Indian soldiers and over 200 Chinese soldiers. A shepherd boy who later became the Head Lama of the monastery was the only witness to this heroic episode. The Chinese dug a mass grave for the Indians and left a flattened ration tin with the names of the officers. 2nd Lt Chattrapati Singh was a valiant soldier and a fine officer who laid down his life at the age of 22 years in the service of the nation. He is survived by his sister Mrs. Kamala Singh. Content contributed by the family members.